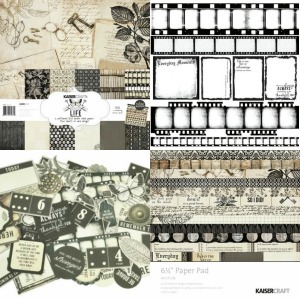 Scrapbooks are all about preserving memories, and with this Art of Life Collection from Kaisercraft, you can give those memories a vintage feel. This assortment of pages, paper punches, stickers, stamps, and embellishments hearkens back to the 1920s. The materials included in this collection stick to sepia and black, adding to the old fashioned style of this kit. The Art of Life Collection sets the tone immediately with a page devoted to graphics that look as if they were pulled from an old science textbook. The accurate depictions of flowers, vegetables, and butterflies would look completely at home on a Victorian-era bookshelf. Some of these elements also include text. "Life is the art of drawing without an eraser" is a beautiful adage for any generation. This set contains 10 double-sided scrapbook pages with images of antique keys, postcards, bookshelves, and more. The Art of Life Collection also has an acetate page that has been stamped with outlines of film strips and distressed frames. Add texture and dimension to one of your layouts by placing this sheet over your photos and embellishments. An impressive assortment of paper embellishments comes with The Art of Life Collection as well. There are over 50 die cut accents that are decorated with text and numbers. Most of these elements leave plenty of room for you to jot down a caption. If you run out of die cut elements, or you just want to make your own, there's a 6.5" paper pad that contains specialty pages such as foil, spot varnish, and die cut pages. To make your crafting a little bit easier, Kaisercraft has thrown in a page of stickers. Some of these stickers resemble brass plaques, while others mimic film strips, but both styles are perfect for journal entries. The Art of Life Collection also includes 4 stamps to help you add instant style to any page. With this kit, you can transform your project into a timeless memory book.